I like to know what’s coming, so for the last couple of years I’ve been printing A3 year planners from this website and sticking them up in the office, bedroom, bathroom… They’re nicely formatted, easy to edit and print, and I can squeeze in notes if I write very, very small. When the new year struck, however, I realised I didn’t have access to an A3 printer, and that all wasn’t quite right with that calendar after all. The main issue I have with those calendars is that as the month’s beginning is aligned according to its day of the week, the position of a day across the width of the paper doesn’t correspond well to its position through the month. They can be nearly a week different, enough to throw of my sense of the time between dates. I wanted a week-by-week calendar, but one that was continuous, rather than the transition between months breaking up the weeks onto different pages or sections. My life doesn’t jump like that, so why should my calendar? 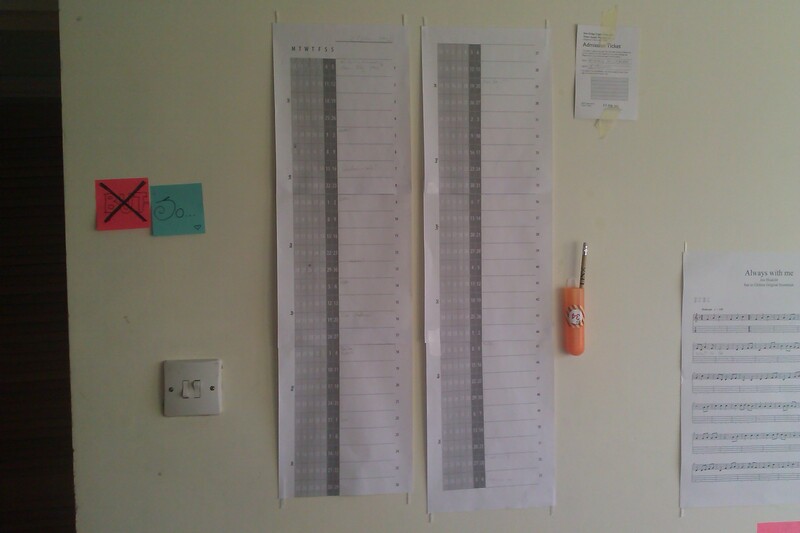 It charts 2014 week-by-week, continuously, and 12 months fit over 6 sheets of A4 paper. I’ve got two versions – one with an extra space for notes each week, which I’ve got in my bedroom for planning and scheduling, and a thin days-only version which I’ll use in the bathroom for tracking weight, exercise, health etc. The thin version can be printed on three sheets by printing the first three pages, putting the paper back in the printer, and printing the last three on the empty spaces. It’s a very practical idea, but I’m disturbed by how short it makes the year look! Yeah, I know what you mean, but better to know, right? That way it can’t sneak up on you… Be prepared, bring a big stick! Also, I only stuck half of it up in the bathroom, the steam from the shower makes the masking tape peel off the wall.